She’s become a regular visitor – and new plant friend. She likes my inspiration and then she shows me all of her plant creations via her photos on her phone. We could talk for hours! It has been so much fun showcasing and selling my plants here – and the best part is meeting new people and making new connections. Without my venture here, I would not have met many new plant enthusiasts as well as avid book lovers. I could write a book on my experiences here – you see, I’m not a huge book reader myself (shh-don’t tell anyone!). Well, let me correct that – I DO read books, but most of the time, actually probably 99% of them, are related to plants, gardening, propagation, succulents, cacti, houseplants, garden tools, tropicals, gardens around the world, bugs, leaves, botanical subjects, etc. My home based office is FILLED with books on 5 long shelves. And, I don’t just “read” them, I use them for my research. The studying never ends in the world of horticulture – it is the name of the game. Learning! But it has been a very long time since I read a novel or love story – LOL. Many times, however, especially during the winter, when I have spare time, one of my all time favorite things to do is getting cozy in a lawn chair, which I keep in the greenhouse for those sunny yet cold winter’s day, and read. I soak up the sun, warmth, sights, and sounds as I enjoy a good plant book. On sunny days in the winter, you can’t beat the warmth. It can get warm enough to not have your coat on and put on a bathing suit top – and get a sun burn if not careful! But the vitamin D is heaven on those cold winter days. I just love reading my plant books there. In the summer, the only time I’m reading in the greenhouse is when I’m looking up a plant problem, and even then, it doesn’t happen much (reading that is) in the greenhouse in the summer cause the greenhouse is filled with plants and plant projects. I’m too busy watering or planting, re-potting, cleaning, and repeat. My greenhouse space is quiet, however, no matter the season. The things I hear are the occasional dried up leaves blowing across the slanted roof top, or a turkey making a cooing sound to his fellow wild friends. Sometimes I’ll hear a hawk – and once, a hawk landed on the top of the greenhouse roof to observe the bird feeder on a tree nearby for his own living tasty treats. He swooped down over to the feeder from the greenhouse roof – what a sight to behold as I was sitting quietly reading, looking up and seeing the span of wings. And, lastly, sometimes I hear a faint meow from my cat walking by, or hear tons of birds chirping in the brush behind the greenhouse – they love that stuff. Anyhow, my point being – I do read, but it seems always to learn about plants – Plants! Plants! Plants! How did this planting thing become such a crazy (as in Container Crazy CT) obsession? Well, let’s not go there – that is another LONG story. This year provided me with MANY new challenges and ventures. I decided to try my hand at houseplants – and WOW, was that ever a fun new gig. I met a wonderful grower, who truly supports me and treats me with respect. I feel this is a gift. A plant connection friendship formed and little did I know – I would learn a tremendous lot about houseplants – by observing, growing them, caring for them, and asking questions when I didn’t know the answer – it’s been all good. And now, I’m fond of them more than ever before. However, no worries, friends. I will continue to offer my other usual too, from perennials to wildly large tropicals. I just like to mix it up every year. It helps us all to grow as plant lovers. Plus, it is fun. Ah, this was fun – making a circular pattern with my BEAUTIFUL succulents! My friend Terri came in to make a big terrarium – one-on-one style – which I offer by appointment at the bookstore on Tuesdays and Thursdays – did you know?!! Alocasia African Mask – I LOVE the look of this plant – and it is a new one for me this year – it does really well indoors in bright indirect light. I also found it has been thriving in a situation where I have one in very organic soil as an under-story like plant (below bigger leaved plants). It does not take full sun well at all – it needs shade. Also, it prefers “moist” soils, but not water logged. I give it a little water every time it is dry to the touch on the top but not soaking water. Oh God – This Canna ‘Cleopatra’ is ga-ga-ga-gorgeous. I scored a few BIG pots of them – full enough to last you a life time if you overwinter the storage organs (as I refer to them), which I teach how in my “Overwinter Plants” workshops – but back to this plant! It is soooo beautiful; the dark toned striped patterns in the leaves and it blooms, not only red, but also yellow flowers! How can a plant offer so much? Those of you who bought a plant at my workshop or from me at the bookstore – congrats. Here, I was showing an elephant ears tuber (bulb, corm – whatever you prefer to call it – although technically they have different names) – no matter, this was a big one! I potted up many this season and sold quite a few elephant ears of my own. One can not have a container garden thrill (or thriller) without one, in my opinion! They last into the fall, bob in the wind, and are easy – they prefer shade but can take sun if you water – a lot! Ah, this photo is showing moon flower seeds. This is another “new” offering by me this season – selling seeds by Hudson Valley Seed Co. All 100% certified organic seed and open-pollinated. Well, I had to sow some of my own of this plant which get huge, tubular, white flowers at end of summer. In fact, my plants are growing in a pot and I trellised them up to the light on my garage with garden twine which they freely accepted – the plant’s vines finally reached the light fixture – and I think it may go as high as the gutters of the garage. Because the seeds are open pollinated, any seed I collect from my plants will be true-to-type for next year’s round. Bonus! You buy one seed packet and you can keep it going on for years if you harvest your seeds from the plant. I’ve been offering so many terrariums workshops – I’m becoming known as the “terrarium lady” – and one day, a customer came in with a terrarium she had owned for one year – a gift from a friend, and it was so overgrown, she asked me to renew it – which I did – and I made up 3 terrariums for her. That was a fun project. BTW, our next TERRARIUMS workshop is on a Monday, August 21st, 6-8 pm at the Stafford Cidery! See http://www.WORKSHOPSCT.com for all the details. Enjoy! July is almost over! If you are an Instagram fan – I’m there under ‘containercrazyct’ – look me up – I am constantly posting photos! The Grand Opening Celebration at the bookstore, where I have been showcasing my plants, products, and gardening items, was so much fun. There was a great turnout and I met many new faces, which I want to say was so nice – in addition to having friends and family stop by. Thank you for attending and supporting local small businesses in and around our towns. It really was a treat to be part of it all. And special thanks to the bookstore owner, Cynde Acanto, for having me part of their opening celebration day. 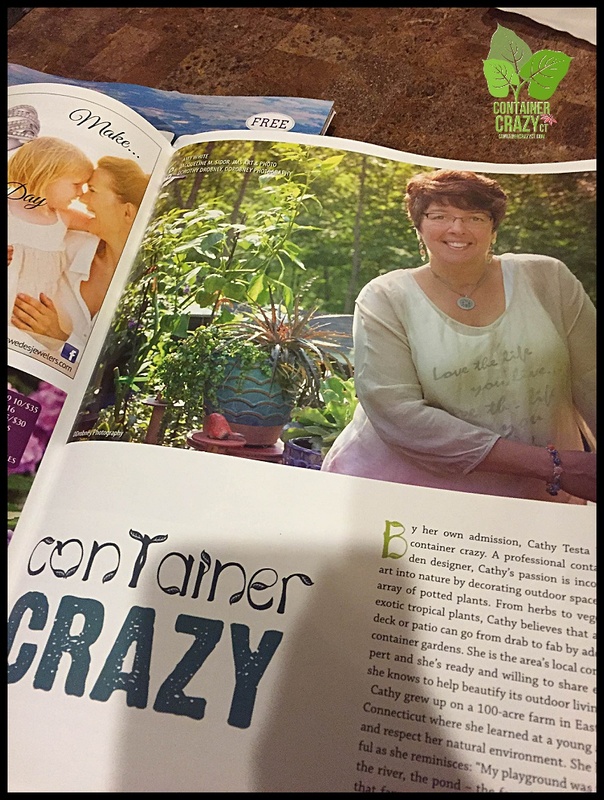 There has been so much going on, and I have my big container gardening workshops coming up starting soon, with the first session happening on Saturday, May 13th, which is one day before Mother’s Day! I have had many mom and daughter teams attend my workshops in the past, and if you want an idea to take Mom to somewhere to make her happy – consider one of my Gift Certificates. They are redeemable towards workshop registrations and plants for select items. They are available via my www.WORKSHOPSCT.com site or by visiting the BOOK CLUB Bookstore in South Windsor, CT (see address below). Each has a beautiful plant related photo on the cover. 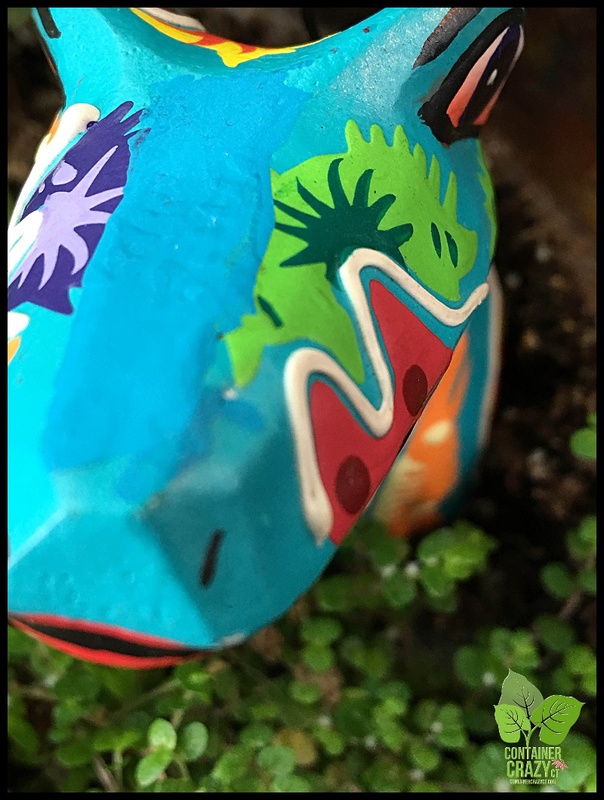 Yesterday was Cinco de Mayo, and I put out some themed plant gifts in the store for that – which I loved doing since I just recently traveled to Cabo, Mexico with my husband. 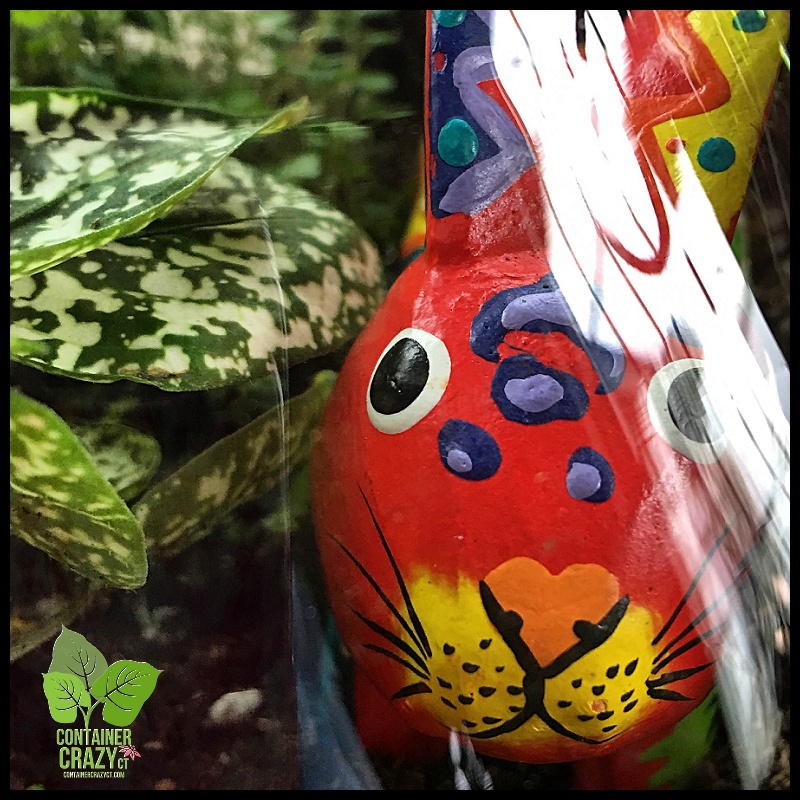 While there, I picked up some special finds – all hand-made and hand-painted art – perfect in terrariums and for succulents. Friends stopped by to grab some right away. Especially for those special people born on May 5th – it is perfect for gift giving. Also, I’ve been taking custom orders at the shop along with offering new items weekly. There are terrarium kits in stock along with terrarium plants, succulents, cacti, and more. I’m also accepting one-on-one sessions if you can not make a workshops date. My friend from the corporate days came to a session and made this beautiful terrarium in a jumbo bowl (above photo). She scored bunnies that I swear look like chocolate. We had a very nice session that day. And, by the way, I’ve added another terrarium’s workshop date on June 10th. Visit www.WORKSHOPSCT.com for the location and time. I’ve made some staghorn fern wall boards with smaller boards for people who’ve mentioned they’d like one on a smaller scale. And there are seeds available by Hudson Valley Seed Co., which is one of my fav seed co’s – all 100% Certified Organic, Open Pollinated and Heirloom. Swing by before they are all gone – I’m also offering a Seed Starting Talk soon (see WORKSHOPSCT.com). But the list doesn’t end there – it just keeps growing. My father’s adorable birdhouses are stocked in the store, which I recently added heavy duty garden stakes to – this is a great way to put them up immediately – or put them in your big container garden. It makes a wonderful pop of color to your plant arrangement. And a home for the birds. Many of my friends and workshop attendees have stopped by to see all and I can’t thank them enough for showing support of my endeavors. It really makes me feel valued when they pop by and visit. I’m having so much fun and have been very busy adding more workshops and making new items. Don’t forget – for those available during the day, I’m offering a free container gardening talk at the bookstore at noon on Tuesday, May 9th, and a restaurant in the adjacent plaza (Red Onion) is offering a discount to my attendees if they wish to pick up a grinder to bring with them during my talk, which is on my “5 Must Do’s for Container Gardening Growth Success.” Just ask for Steve, the new restaurant owner, and say Cathy T from the bookstore sent ya. It is a 45 minute quick talk and demo since I have to get back to work immediately following. I hope to see you there. This weekend is Container Crazy CT’s first session on making terrariums. Saturday (tomorrow), 4/8, 11 am. Located in South Windsor. Note: We can squeeze in one or maybe two more last minute attendees if you are interested! We are offering a second session at Container Crazy CT’s workshop space in Broad Brook on Wednesday, 4/12, 5:30 pm. This session has a few seats open. To sign up, visit our sister site WORKSHOPSCT.com or text me at 860-977-9473. I’m super excited because my terrarium plants are just the right size, adorable, and healthy. Container Crazy CT works hard to make sure your plants selections are fresh and new for every workshop. Lots of love goes into their care. At the workshop, 3 plants for your terrarium are included, but you may decide to buy more if you really want to ramp it up in your glass vessel. We have many selections. And we go over all the maintenance, care, and more in the workshops. Here’s a sneak peek. To see many more, visit my Instagram feed. 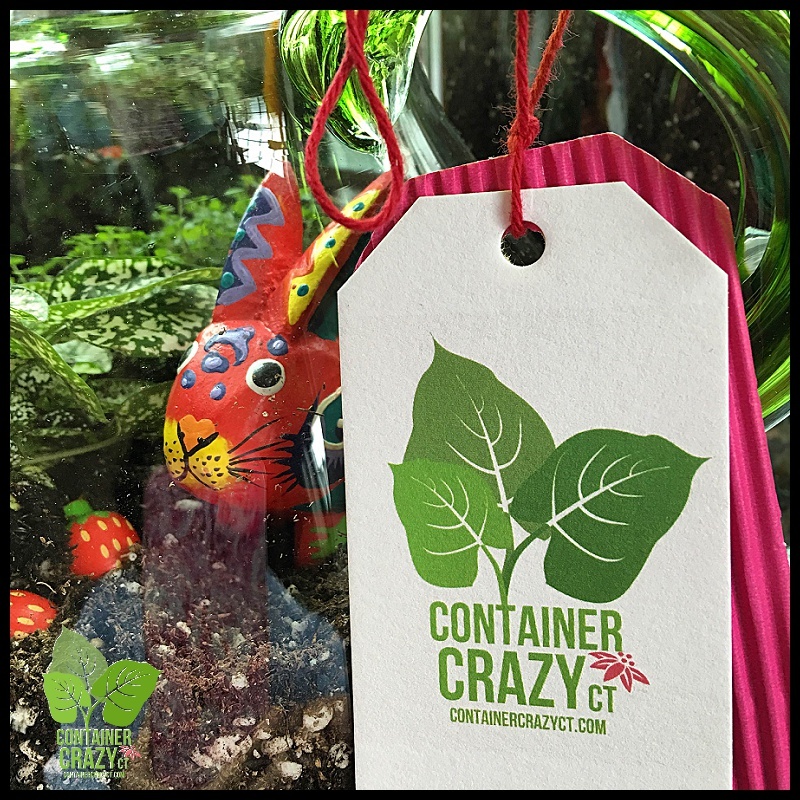 Container Crazy CT is offering Microgreens Starter Kits and soon to be added are Terrariums Packaged Kits! If you can not make a workshop, these are available. Stop by the BOOK CLUB (869 Sullivan Ave., S. Windsor) or contact me for more information. Snow -Go Away! I want Spring! Well – there it is – snow – ugh! After yesterday and Tuesday’s beautifully sunny days, I don’t want snow. I’m in spring mode already – I have been offering demonstrations on Microgreens this week, setting up my display items at a new venue (BOOK CLUB) in South Windsor – and ordering and planning all for Container Crazy CT’s upcoming workshops. It is never a totally easy process as one may think. There are lots of steps involved, but so far – all is good. We are ready for you. To kick off my showcases at the relocated bookstore, BOOK CLUB Bookstore & More, I am offering a FREE presentation tomorrow, Saturday, March 11, 2017 at 10:00 am to 11:00 am. This presentation is about “Six Design Tips for Container Gardens” – and it is a slide type presentation which covers tips on how to design large and lush container gardens. If you struggle with this aspect of your patio pots and want to learn some great tips – come on by. These tips will help you – and the first 10 or so people to arrive receive a free plant catalog. Following the presentation, browse the bookstore’s offerings and Container Crazy CT’s showcases of Plant Gifts, Succulents, Terrariums, Wall Art, etc. Speaking of wall art – This workshop is coming up. Registrations are still open but we are nearing the time when we need your confirmations. If you clicked ‘going’ on the EVENTS pages, please click CONFIRM to reserve your seat and items. This workshop is being offered on two dates. First one is March, 11, Saturday at my Broad Brook, CT location and the 2nd session is March 22, Wednesday at the BOOK CLUB’s South Windsor location (869 Sullivan Avenue in the United Bank plaza). For the Newbies interested, pre-registration with confirmed payment is required. Be sure to read our guidelines on WORKSHOPSCT.com. Due to a limited number of seats and plants – if you want in – now is the time to confirm. The conference has invited me to speak on March 28th at 10:30 am. It is an all day conference at Maneeley’s, 65 Rye Street, South Windsor and registration is required. My topic will be on Micro-greens – and Starter Kits will be available for purchase or order following my demonstration. If you can not make the session above, I will be offering my demonstration again on Friday, March 31st at 5:30 pm. Pre-registration is recommended. Fee is $10 to attend. Again, you have the option to purchase Starter Kits following the demonstration. Everyone loves trying it out after they learn how to grow Micro-greens easily. It is a perfect “wellness” topic – because micro-greens (and sprouts) are packed with nutrition. I highlight this aspect as well at the demonstrations. As noted on WorkshopsCT.com, terrariums are on the list of topics – and perfectly timed for showcasing them at your home for the Easter weekend! But Easter is not the only theme you may use, there are many. We plan to have slow growing plants and succulents for this workshop. Dates are: April 8th at Book Club, and April 12 at Container Crazy CT’s location in Broad Brook, CT. If you are new to container gardening or have had issues with your patio pots in the past and don’t know why your plants don’t thrive – this session is very beneficial. We hope you will join us. The Book Club Bookstore is holding a Grand Opening on April 29th. Check out their Facebook page or bookclubct.com for details. Author appearances are in store (literally). And what is even more exciting, is the authors on this date are local South Windsor Authors. The bookstore has a wonderful selection of new and pre-owned books, and the owner, Cynde Acanto, is very helpful and knowledgeable. I’m in awe of her book knowledge and I have a feeling I am going to be learning so much there from her customers too. My head has been stuck in gardening books so much, but now I’m learning about so many genres. The store has many gardening and plant books too. As for my showcases there as a permanent vendor, I plan to “change out” plants regularly – so as you come by for a visit, bear in mind, it will be ever-changing for each season. Expect to see a variety of plants, and creative ideas on how to use them. Special orders may be requested. Grab a pamphlet to learn more while there. My regular hours at the store are 10 am to 6 pm on Tuesdays and Thursdays. – and of course, I am still operating out of my Broad Brook location every day of the week. This week was kicked off by a sensational Super Bowl game, which I know not from watching it but from reading all the excited posts about the game the very next day on Facebook. Because I am not a sport’s fanatic, I didn’t stay up to watch the game, but it was very entertaining and inspiring seeing all the comments on Monday morning from friends’ posts, which spurred my interest for sure. Fortunately, we had recorded the game before going to bed on Super Bowl Sunday. I have to admit, my motivation for recording the game was to see what Lady Gaga would do for her performance, but Steve also wanted to view the game the next day after work. Due to all the hoopla on Facebook, we both were anxious to see the final seconds in particular as soon as Steve got home from work Monday evening. As we were viewing it, however, an unexpected prompt appeared right before the last 3 minutes on our TV recording system indicating we ran out of recording time. ACK! How did that happen? The game went into over time and I guess that is why. You can’t imagine how disappointed we were. That rule of “what can go wrong, will go wrong” occurred in that moment, and I’m sure we will never record something without considering the over time factor ever again. I decided to start this blog post with the fact we experienced an after-game excitement, but then a bit of let down, but no matter, the whole event was fun regardless, and we moved on, learned from it, and said well, better planning next time. This year, I believe, will be filled with excitement at Container Crazy CT because I am offering more new workshops. And lots of “planning” is involved. My workshops have already begun for 2017 and many plans are underway for more and new ones – from ordering plants, posting updates, letting everyone know what is coming up, and more. There are many steps involved, you can’t imagine. And in the gardening world, factors like climate, plant availability, changes in season – are out of our control, but we do our best to look ahead and consider the unexpected’s. My workshop offerings start off with this weekend’s, for our second annual “Flower Arranging Workshop” – and all seats sold out. I’m thankful the big snowstorm coming Thursday is before Saturday when we will have a great day learning about floral design and succulents in floral arrangements. But we do plan ahead and have snow plows always ready and a backup date “if” it a big storm was to occur on our schedule dates. The next workshop up is my “Botanical Living Wall Art” workshop, which I’m even more excited about and have all planned out – Hopefully no surprises will occur at the last 3 minutes – but we adjust – as we always have, which is often the case in the gardening world. This a new workshop with a living plant and custom made canvas board. The creativity will be happening in this event because there are many opportunities to do so. Following the March “Botanical Living Wall Art” workshop – being offered two times, one session in Broad Brook and the other in South Windsor, we will have a building “Terrarium Bowls“, and of course, my annual “Container Gardening Workshop” is being held in May again on several dates in Broad Brook, Vernon, and South Windsor. Be sure to stop by so you don’t run into overtime and miss the excitement or opportunity to be part of it – like Steve and I did with the game. Seats are limited in some sessions so pre-registering early is recommended. Container Crazy CT’s blog is all about combining nature with art, plants, and workshops. OK, I’m just gonna say it – This week’s weather was crapola! 10 degrees below normal, low clouds ALL week, cool, damp, raw, and wet. We are so looking forward to when the sun comes out to play – which is hopefully today. Today, from 10 am to noon, I will be offering terrariums for sale at Book Club Bookstore & More for Mother’s Day. When you consider this week’s weather, this actually turns out to be an excellent gift option for Moms because it is too cold to put some plants outside right now. 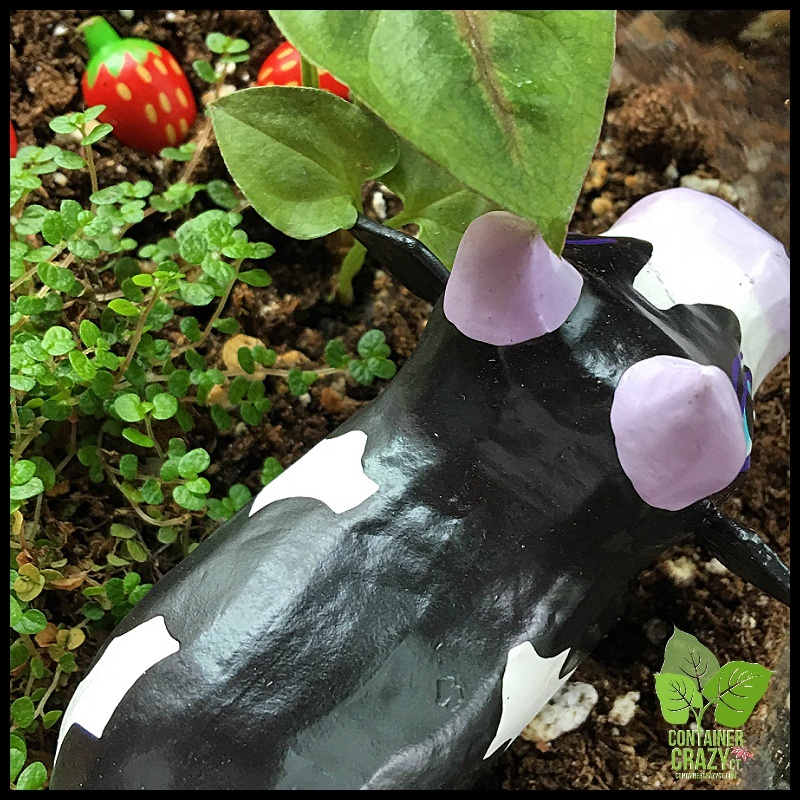 It makes a wonderful centerpiece and is easy to care for – requiring very little watering, and with the unique decor of colorful barn animals, I think they came out just adorable. 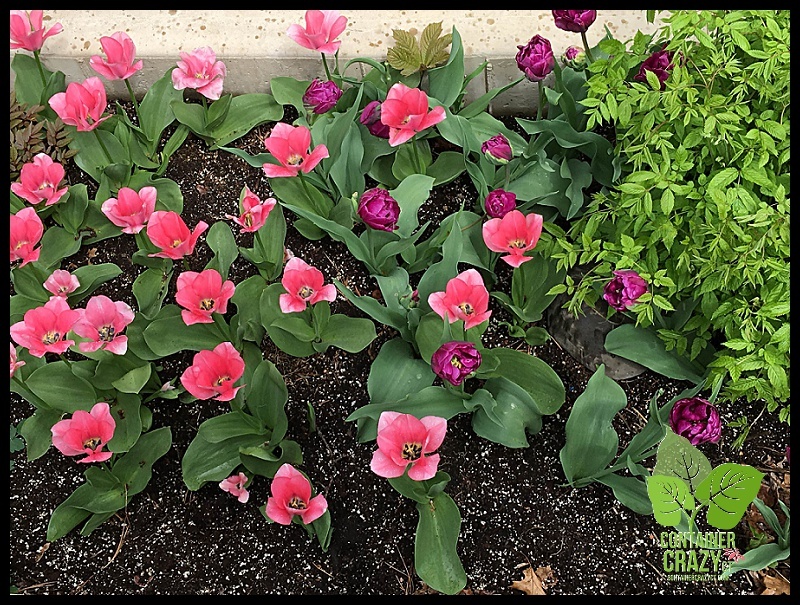 Each one is layered like a cake with pea-sized gravel for drainage, activated horticulture charcoal to help improve drainage and keep the soil healthy, and well draining soil. Added are slow release prills to feed the plants for months, and of course the adorable, colorful animals as this go-around’s theme. I really enjoyed assembling them for this Pop-Up Event today. 100 Main Street, Broad Brook, CT 06016. I’m happy the bookstore invited me again, as well as some other artsy vendors to participate – it is a fun way to spend the morning. There will be candles, other wine related art (can’t wait to see what it is), adult coloring books, and a featured author, etc. It may look like a small bookstore but it is packed with great books and I think I’ll bring a terrarium book along with me to show folks interested in this information. Well, there are things I didn’t realize about tulips because I haven’t really planted them before to be honest – they last a LONG time, they enjoy the cool weather (which we had all week), and they close a bit every evening. I am IN LOVE with them. They pop color from so many views (from my bathroom window, when I exit my basement, when I’m in the yard and can see them from a distance). They have been the sunshine during this cloudy week – the color is so vivid. To help reduce their munching visits, I scatted some hot pepper on the soil and that kept them away for a little while anyways. Next year, chicken wire will be laid over them to avoid that scenario, cause now I’m hooked. By the way, I dump my left over soil from the prior year’s container gardens into this cement planter – this why you see perlite in it, etc. 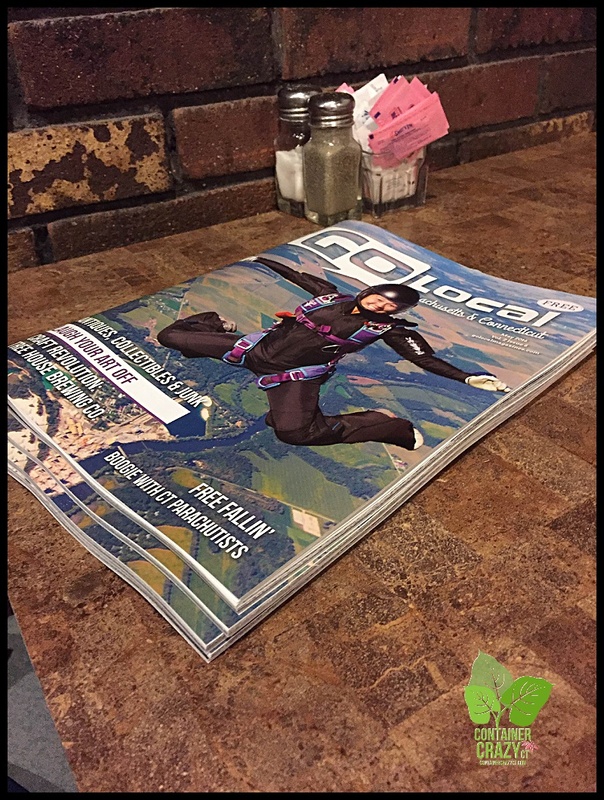 It is finally issued and out in local stores – and friends have been spotting it. I’d like to thank Go Local for featuring me and other local artisans and small business owners. It was great meeting them and having their writer visit before I took off to New Orleans for the Jazz Fest weekend. Also, I want to point out – We made an error on the photos of me – The wrong photographer is noted. It was Karen Ladany of Debut Camera Co. who took the pro photos of me on my deck and by my red table shown in the magazine. I think my rush before vacation with lots of emails back and forth, and sharing several photographer’s work, caused an email mix up with the publisher and we both feel badly about that. Other photos in the issue were taken by their photographer as well. Karen’s photography style is one I absolutely love. She captured up-close flowers and the essence of many of my container gardens in a way is hard for me to describe, but my eyes see it. I have some of her photos on my www.WORKSHOPSCTS.com blog site as well – She took photos of my flowers, planters, containers, and even a wild turkey that decided to quickly strut by us as we were doing the photo shoot that day – and it was the hottest day of that summer. We were sweating but she was getting ready to move, and so I had to grab her services before she took off. She’s excellent. I’m sharing some of my iPhone quick pics from yesterday’s visit to the CT Flower and Garden Show in Hartford, CT. But fair warning – If you are the type that doesn’t want to see anything revealed before you attend, this is your spoiler alert! Enhanced food court sitting area – Nicely organized with a long bar area, couches, more tables for sitting and relaxing (located by the landscape display areas). It is larger this year, well situated, and relaxing between walking the show floor. Just be careful, if you sit on one of the cozy couches, you may not want to get back up. Rearranged vendor spots– While its helpful to be able to locate your favorite vendors in their usual locations on the show floor, there were some vendors located in new spots which made it feel changed up a bit to me. I liked that. Runs thru Sunday, Feb 21st. Opens at 10 am each day. Tip: Go early, parking in the garage tends to fill up quickly. In the back row area – Always enjoy the display by Snug Habor – lots of small hand-made hypertufa pots – adorable, small and unique items. Plant sales by University of CT (left). If you didn’t know, they sell plants from their greenhouses on North Eagleville Road in Storrs by the campus. The photos on the right are from an area at the show on the back right beyond the landscape displays. They have tons of flowering plants and all in full color right now – I believe this is a group of growers that put these out for sale. All healthy. If you like staghorn ferns – wow – look at this show stopper – was in the back area by Snug Harbor’s booth. Beautiful and tempting. Over in the far left area is the floral and plant competition space. Look at these amazing cacti and the shoe! There were pieces of significance and really enjoyed browsing this area. Be sure to check out the jewelry pieces made with seeds, plant parts, and earthy finds. Because of my passion for patio pots and container gardens, I especially enjoyed this piece of art – LOVE how the creator inserted a small pot of a dripping down spiller style plant. In fact I spotted this plant in the back area in hanging baskets – what are they called again? I’m having a blank moment, but they are adorable, beaded like plants and fun to use in container gardens – as noted above. Globes, globes, globes are everywhere. Almost every plant related booth had some. They are hot – hot – hot this year and the admiration of these seems to be growing every year. These above are from Natureworks (middle photo) with the adorable bird’s nest with eggs, and Balleck’s on the left and right. We especially liked the thick glass container (left photo) from Balleck’s – a little different, thicker, heavier. If you are looking for color – it is not in short supply at the flower show. Art and beautiful plants show them off – just look at this moss basket by Balleck’s – Wow, I “almost” purchased that one – it is popping with oranges and yellows. And I probably shouldn’t have – but I got some of these yummy cookies by Savor. The ladies standing next to me purchasing some told me they enjoy these cookies and return every year to buy some more. They are a small sized cookie which justifies the guilt of eating the extra calories. And that is all I will post today – as I don’t want to spoil it for you. You should head there today or this weekend. We are lucky this year – no snow to deal with and the sun is shining today. Go check it out – you will enjoy the show. P.S. Lots more photos on my Instagram feed.